The title of this post is taken from the 1973 film Soylent Green, set in the dystopian, overpopulated world of 2022. The bulk of the world’s population subsists on manufactured food called Soylent Green. Charlton Heston plays a police detective charged with investigating the murder of a wealthy businessman. At the end of the movie, Heston discovers that Soylent Green is made from human remains and, seriously injured, he tries to spread the word that Soylent Green is people. Corporations are not people in a physical or moral sense, of course. No corporation could be mistaken for a human being. Nevertheless, corporations are considered to be persons in a legal sense. Before I get into explaining this, I should begin by saying just what a corporation actually is. Many people on the Left seem to think that a corporation is some sort of alien entity that dropped down from outer space and is intent on using up all the world’s resources. While there are certainly corporations that act like that, that is not what a corporation is. A corporation is simply an entity that has been incorporated through legislation or a registration process established by law. A corporation is one of three ways in which businesses are legally organized in the United States, the others being sole proprietorships and partnerships. A sole proprietorship is owned by one person while a partnership is owned by more than one person. In each case, the owners of the business are entirely responsible for any debts or damages the business accrues and there is no legal distinction between the owners of the business and the business itself. With a corporation there is a legal distinction the between the owners of the business (the shareholders) and the business itself. A corporation is a separate legal entity from its owners and this is where corporate personhood comes in. Because a corporation is a legal person, the owners or shareholders can enjoy limited liability for the debts or damages incurred by the corporation. They are separate from the corporation and are not financially responsible for the corporation beyond what they have invested in it. There are actually some very good reasons why corporations are considered persons. Suppose you own a few shares of Acme Widgets. This makes you a part owner of Acme Widgets, even if the shares you own are only .01% of the total number of shares. Now, suppose someone is injured when one of Acme’s widgets explodes and he decides to sue Acme Widgets for negligence. If the corporation were not a separate legal entity, or a person, you could be held partially responsible for Acme’s negligence and you could be required to appear in court, along with thousands of other shareholders. If the court rules against Acme, you could be required to pay part of the damages. If Acme Widgets goes out of business because their widgets keep exploding, you could find Acme’s creditors at your door, demanding that you pay your share of Acme’s debt. Also, that man who decided to sue Acme Widgets might find it very difficult to sure a thousand separate owners of Acme Widgets. Since the corporation is a legal person, it can be represented in court as a person, and found liable for damages, indicted for crimes, etc. Considering corporations as persons makes it much easier for the courts to deal with them. This limiting of liability is the most important advantage the corporation has over other ways of organizing business. Because liability is limited, investing in the company is less risky. Were it not for limited liability, only the very wealthy, or reckless, would be able to invest in the stock market, and companies would find it much more difficult to raise capital. There are a number of controversial issues relating to corporate personhood, especially regarding just what rights corporations have compared to actual human beings, and like anything else, the concept can be abused, but the idea of corporate personhood itself is a beneficial one. I get e-mailings and catalogs from Hammacher Schlemmer, a store that offers the best, the only, and the unexpected to customers, for a high price. I think I have only bought two or three items from them, as gifts, but that is enough to put me on their mailing list for life. I can’t complain though. They do sell some interesting things, though way too expensive for me. In their last catalog I saw Hammacher Schlemmer has Zoltar Speaks. 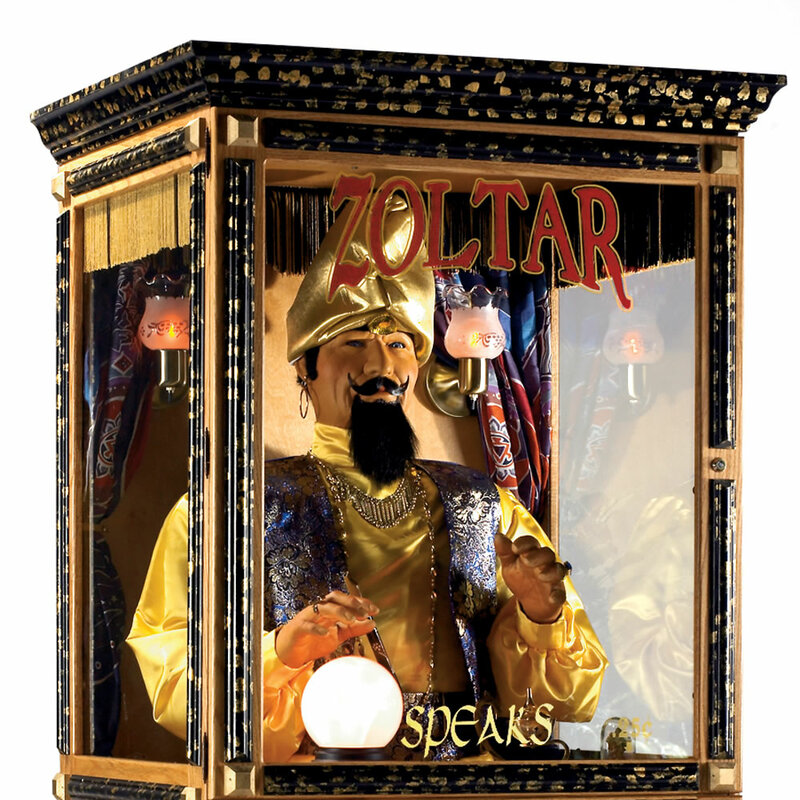 This is Zoltar, the classic animatronic fortune teller found in arcades, that stands 6 1/2′ tall, and augurs a spoken and printed fortune for you. Richly detailed with a handlebar mustache and beard, a gold head wrap, gold shirt, paisley vest, and jewelry, the bust of Zoltar stands in a solid wheeled cabinet of oak with birch veneers, finished in gold-and black-painted trim, and is surrounded by three panes of tempered glass. Zoltar acknowledges your presence and invites you to approach him. Once you insert a quarter (coins may be removed), Zoltar nods his head up and down as his crystal ball illuminates and he sweeps his hand back and forth. Zoltar provides 16 different spoken fortunes and dispenses one of 23 different printed fortunes in the form of a paper card; 2,000 fortune cards are included. The fortune is dispensed from the front of the cabinet. The manufacturer has confirmed that this item meets U.S. Federal toy safety standards for lead. This is the fortune telling machine in Big that grants Tom Hanks’ wish to be big. It can be yours for only $9000. Here is something amazing from MIT. Some students have learned how to store the electrons, (that provide the electricity for electric cars, and everything else for that matter), in a semi-solid “gel” that can fill up an electric car, not unlike filling up a car with gasoline. Forgoing the traditional route of storing electrons in either nickel or lithium-ion, the MIT students have figured out a way to store electricity in semi-solid flow cells. Called “Cambridge Crude,” the charged particles are stored in an electrolyte gel that can be removed and refilled when drained, not unlike how we currently fill our cars with gasoline. The gel would move between a charging area, and dispensing area, sending electrons straight to the drivetrain. Perhaps even more importantly though, this technology can (supposedly) store 10x more electricity, at half the price of current conventional battery technology. They are working on building a prototype in about 18 months. As the article says, this could be a game-changer that actually makes the electric car feasible. There is one problem that I can see. If electric cars do become common, maybe even only 10% of the cars on the road, then the demand for electricity will go up. Since we are not building many power plants, it is likely the price of energy will go up, making the electric car less economical than a regular car and sort of defeating the purpose of introducing them in the first place. Anyway, there is more information here. Would you sign a petition to ban job killing ATMs. The Media Research Center asked people to sign such a petition. To their amazement, people actually did sign it. We had a lot of people who thought it made sense to get rid of cash machines and for a variety of reasons.Some didn’t like the usage fees and concluded that the best way to get rid of the hassle was to get rid of ATMs altogether. Other’s wanted to see America return to a simpler time when we all got our money from our friendly neighborhood banker who knew your name, smiled at you and gave little Billy a lollipop after which you could hop in your horse drawn carriage and return to your candle lit home. One woman even said that ATM machines were bad for the environment. Had we stood out there all day we could have undoubtedly gotten hundreds of signatures on our fake petitions. I don’t think that is any dumber than signing a petition to ban dihydrogen monoxide.